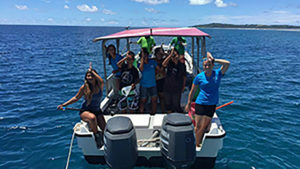 In June, I was fortunate enough to help run a marine biology camp in Yap for MCC. 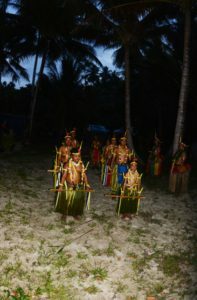 I had been to Yap before on a dive trip, but I knew this would be a much more profound experience. The goal of this camp was to educate kids about the ocean and the animals that call it home as well as learn about the culture of Yap. We had two families from Guam along with four girls from a local high school. At the meet and greet on Sunday it was obvious that everyone was very excited to be there and I knew this was going to be a great week. Each morning, we gave lectures about basic oceanography, different marine environments, the importance of coral reefs and mangroves, and the animals that call those places home. Then we headed to the boats to explore the coral reefs and mangroves to experience the ocean first hand. Every day brought a new first; watching mantas feed, getting joined by dolphins while we rode in the boat, seeing turtles swim by as we snorkeled, following a bait ball in the boats, and being in the water as sharks swam past. It was amazing to watch the excitement in the girl’s eyes as they swam over the reef looking at it in a whole new way. The squeals of delight at seeing fish and turtles swimming around them reminded me of the joy and passion I had growing up. On the water, the goal was to slowly get the campers used to what scientific work is like in the field. They had depth gauges, refractometers, and a gps unit to capture data at every site we visited, and became very good at becoming mini scientists! We had the older campers take the waterproof paper with them on the snorkels to record fish and coral counts. One of the most exciting field days was when we took the parents along for a family science day. On that day, we put out a BRUV unit to hopefully catch some shark activity on the reef. BRUV (baited remote underwater video) units are made of a camera mounted on a metal frame with a bait canister below. We lowered our BRUV from the boat onto the reef into a sandy area that we hoped would get us some good shark footage. The line was marked with a bouy and left for fifteen minutes while the camera recorded all the marine life that was attracted to the bait. We then pulled the BRUV up and analyzed the footage back in the classroom. There was a lot of shark activity at the surface during the deployment and retrieval of the BRUV, which made for some great photo ops and lots of excitement from campers and family members! 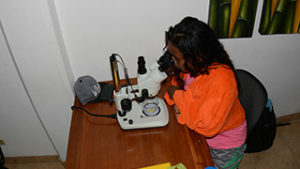 In addition to marine biology, we also had the chance to learn about Yap culture. We were fortunate enough to have Larry Raigetal come speak to us about his journey from Yap to Guam for FestPac 2016. It was a moving talk about the effect of climate change on the islands of Micronesia and the use of local navigation and canoe building traditions to make the journey. That same evening, we had the chance to go out at night and look at the stars and learn more about navigation from a master navigator and teacher. That is an evening I will cherish forever. Our last night we had a family beach bonfire. There was a traditional dance performed by local children, including one of our campers. It was a beautiful performance that, to this day, I still have trouble finding words to describe. After the performance, we built a fire as the sun set and made s’mores while the campers debuted their skits. All of the skits were about something they had learned about over the week. As a teacher, it was fulfilling to know that the campers had retained the knowledge they had been given. It was a special night that none of us will forget anytime soon. Talking the last day and seeing how much everyone had learned during camp was amazing, and we were able to hear all the ways the campers wanted to continue to be a positive change for the ocean in their communities. The way to effect change is to first educate people on why they should care about saving something, and I feel like the week spent in Yap learning, laughing, swimming, and observing did just that. I am in awe of how everyone grew that week and I cannot wait to see what changes they make in the world.